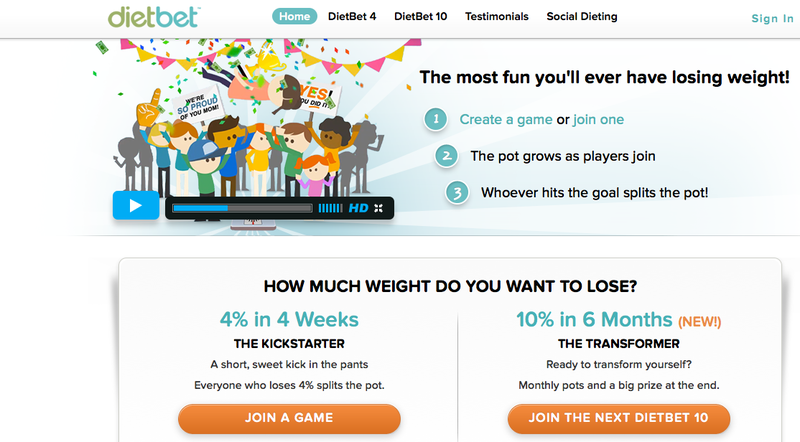 Have you heard of Diet Bet or Diet Better rather? It is a part of the newest (or new to me) online phenomena called, Social Dieting. My sister-in-law turned me onto it about 10 weeks ago. I played a “round” that lasted 4-weeks and the bet was $25. Anyone making their goal won some cash by splitting the pot. I took home a whopping $43 and change which I could either receive in a Paypal payout or put back down for another round. However, I must say that I don’t think that the possibility of just one person winning it all is very likely with 528 total players. In fact, even if 25% of the players don’t hit their goal then the take home pot for the remaining players will be around $175. Not bad, but really even if I don’t make it all the way through if I include the single round from earlier I will have lost approximately 7% of my body weight since Super Bowl Sunday. Not bad and much cheaper than a personal trainer! When you get down to it the site is about goals, motivation and accountability. For me, it’s working as I know I have that weekly weigh-in. In this regard it is a lot like weight watchers, except I can win cash and I don’t eat a lot of processed weight watcher products that I will eventually stop buying. Currently, I’m closing in on the end of Round 1 of “The Transformer” and I am doing well. In Round 1 a player needs to lose 3% and I’m 93% to my goal for this round meaning I have a little less than half a pound to lose in the next 10 days. On the Diet Better site you have a profile which you can make as private or open as you wish including if someone can see your weight. For official weigh-ins you submit 2 photos each week (suggested) or you can not weigh-in and just do one official weigh-in for each round approximately every 4 weeks. If you do weigh-in each week then you are entered into drawings for prizes like gift cards, cookware and fitness equipment. I’ve weighed-in each week to keep myself moving toward the target goal of a total of 10% overall. Your photos and weight are reviewed by a third party of the site and you get a confirmation email that your photos and weight have been approved. Photos are in “airport security attire” meaning that you are wearing shorts and a t-shirt sans shoes. One photo is full body and the other is of the digital scale (digital required) with a password the site gives you for each weigh-in. At each submittal you check a box stating that you understand that you may be audited at any time for submittals. I would surmise that someone who magically loses a large percentage of their weight in a short amount of time would be audited. The game is set up to be fair and reward steady progress toward your goal. Overall I like it! Plus, assuming I hit my goal I will be at or near my performance weight for my ultra marathon come June! My Fitbit feeds into the site so I can share activities and even weigh-ins from Fitbit if I so choose. Other fitness social media as well as standard social media can be attached to feed into or out of the Diet Better site as well so it’s obvious that some thought and planning was put into this site. The combination of Diet Bet and Fitbit are really helping me stay on track day by day and hour by hour. All the data I need is available and I can check where I am at any moment of any day and make healthy choices accordingly. Give it a try if you want a new and different way to get motivated about dropping a few pounds! Just be realistic and help yourself by helping others stay motivated! I’m sure I will keep you all updated as I progress through the 6 month challenge.